In case you haven’t heard yet (I hope you have, mom and dad)…Windows 10 was officially launched today. As a small token of Microsoft’s appreciation, all or most current Windows 7, 8, and 8.1 users get a free upgrade to Windows 10. Microsoft is acting like this may be the last operating system they ever create, as if it’s the one to end them all and Windows will simply “learn” as you use it in the foreseen future. I kind of hope so. I don’t like the way Windows 11 rolls off my tongue. But what I’m really excited about is one thing in particular. And it’s not quite dead yet. At least not for people still reliant on ActiveX and extensions. Microsoft has finally dethroned its bumbling old browser veteran of 20 years from the limelight, calling up a new kid named Edge. Move over, Internet Explorer, there’s a new sheriff in town and it looks like it took a page out of Chrome’s book (no pun intended). For the actual installation of the system, I had to wait until 6:00 pm to get the email that contained my Windows 10 installation. I had just come back from eating at an authentic Mexican restaurant when the message appeared in my e-mail. The installation ran all night and I eventually was too tired to sit through the whole thing. I don’t have any pictures of my transition to 2015 computing but I can tell you it was a thoughtful experience. Sit back and relax I was told, but I fell asleep on my way to awesomeness. Update July 30th: Now I open up my newly christened Toshiba laptop and discover my login page, which looks a little different. The conversion from Windows 8 to Windows 10 is now complete and my first day with it looks very good indeed. I met Cortana today but she’s not quite the scary android assistant I had in mind though I got her to say my name. The feature image is of my new desktop after the transition from 8 to 10. Note about the Apple logo background: I do not at all endorse Apple products nor is it a quiet protest against Windows products. Will those words hold up for good? Only time can tell. 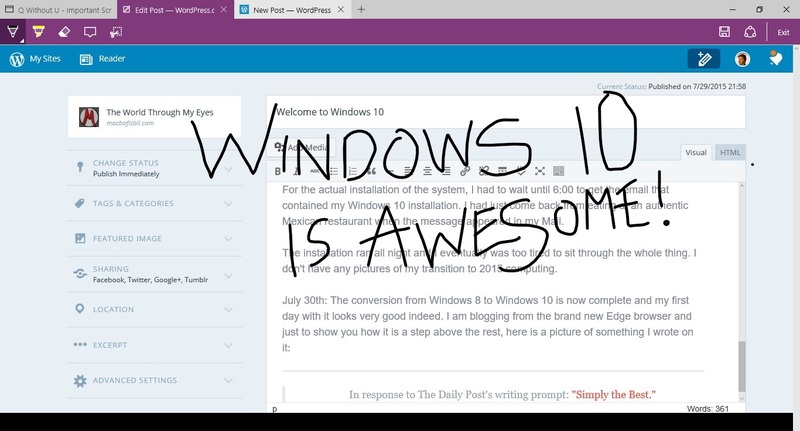 But anyway, I would like to welcome my blog and WordPress to the Windows 10 world. Happy trails. I think you should just go ahead and download it because it’s really a great experience and you’ll surely love it. If you are using Windows 7 it might be an awkward transition because you’ll have to get used to things like the tiles but for people like me going from 8.1 it is a breath of fresh air. Okay, I will. I just got my first PC this year and the 8.1 was so impossible that a friend showed me a download to make it more like 7. My heart belongs to Mac which I’ve used since 1983!!! But I’ll keep trying on my second computer which is an Acer..And I will try 10. Thanks for the advice, Macbofisbil!!! You’re welcome and good luck! A Mac in 1983? Last time I checked the Mac wasn’t released until 1984, but the point is irrelevant. That is possible–what’s a year among Friends? I think it had 8 K memory and those floppy disks you had to keep inserting. It all seemed so hard. Luckily, my friend’s husband was a Mac expert for the school district and so i could call on him. Never thought things would go this far. Oops..Just Googled it. It was 128 K! Quite a discrepancy between my memory and the facts. The Apple Lisa and Apple IIe came out in 1983 so you probably had one of those. The Lisa was only produced for one year before it was Mac all the way. And I’ll end the debate here: it was named after Jobs’ daughter! Ha! A harbinger of things to come. No, you were right before. I looked up the 1984 model and that is what I had. Over 30 years of Mac all the way! Now I have a PC in addition–mainly for watching videos, but my heart will always belong to Mac. They coexist peacefully in my house. Your memory is corrected. 30 years of Mac. You’ve basically been there from the start. I’m a PC guy. I put up with the occasional errors and bugs that get in the system out of love.